Nonito Donaire knocked down Jorge Arce with a left hook late in the third round tonight. He retained the WBO super-bantamweight title and send the Mexican veteran into retirement. 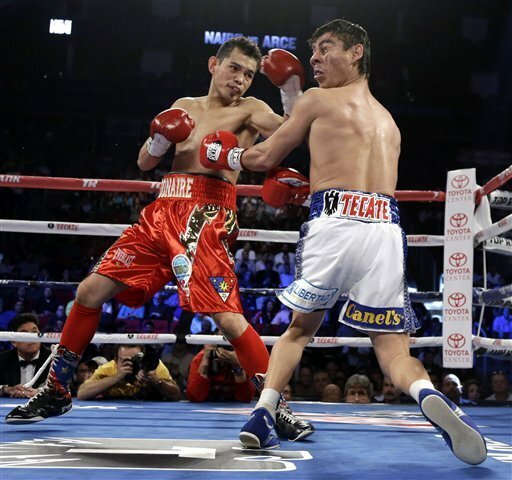 Jorge Arce is retiring from boxing following his loss to Nonito Donaire on HBO boxing. Arce claims he promised his family he'd hang up the gloves if he lost the bout. The 30-year-old Donaire hasn't lost a fight in more than 11 years. Arce with about 2 minutes to go in the second round with a right-left combination. Donaire, from the Philippines, with his 20th knockout improved to 31-1. On the other hand, Arce dropped to 61-7-2Donaire keep his cool. Tunay na kahanga hanga ang pinakitang pagiging cool ni Donaire amidst the boos. Donaire won in front of a raucous, mostly pro-Arce crowd of 7,250 at Toyota Center. Congratulations Donaire for making the Filipino proud!